Before I start this philisophical post, I’d like to thank the settlers of Kelly, Wyoming for locating the town in a corner of Grand Teton National Park (GTNP) in the 1890’s. Back then the town was named Grovont, eventually chaged to Kelly to avoid confusion with another town in the area. For visitors in Jackson Hole during the government shutdown, the road to Kelly provided acccess to the edges of GTNP along Antelope Flats, and a route through the park to the Gros Ventre Valley while GTNP and YNP were officially closed. I’m still pissed at those that caused the whole shutdown debacle – we all know who they are, so there’s no need to mention them here. The common theme among photographers during that week was to focus on a much smaller area with gratitude for the few opportunities we had. 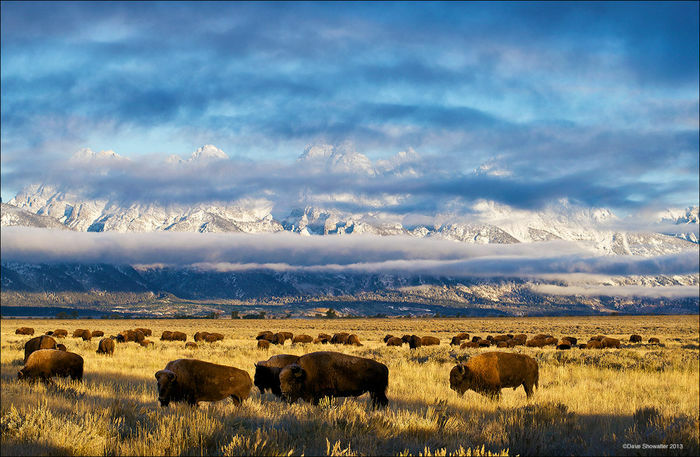 It was a sort of Thoreauvian mindset of checking on the bison herd, the three moose along the Gros Ventre River, the pronghorn herd – still in rut and not migrating because of mild weather in Jackson Hole – and the Great gray owls on the edge of town. All of that and the lingering fall color seemed to keep everybody busy, and focused. The image on this post happened only because I wasn’t somewhere else at the time – there’s something to the concept of persistence and working the same area. But, these are our lands and we should never be denied access. There are a couple of lessons beyond beyond the obvious “make the best of your situation”: First, national parks have imaginary borders that wildlife don’t recognize; so explore the edges. Second, never miss a chance to be inspired or to inspire others. And finally, to those who would shut the gates and deny access to our national parks, our legacy, and the opportunity to inspire others, may your actions be repudiated harshly. May you rot in hell. A lot of folks were hurt across the country – that’s a damn shame that we won’t soon forget. Posted in Photography, Politics, Wyoming on October 23, 2013 October 23, 2013 by Dave Showalter. ← Previous: "Ghost Of The Forest"
Dave your work is as always Stunning! I support your views 100% and to imagine elected representatives who jobs are to serve and protect have sold out to Corporate America. They no longer try to hide it. Dave I’m extremely proud to say I was a high school friend of yours and wish you nothing but the best. Your skills go without question. History can not be forgotten and must continue to be at the forefront of how future decision are made. Thanks Chris! I appreciate your friendship and support and hope that we can connect in Rockford sometime. This trend towards intolerance of any other view than some half-baked ideology isn’t new, but it permeates into issues that should have no political strings attached. The parks take in money for Pete’s sake, they make a real, tangible difference in our hectic lives. Remember the first time you saw a bear? A wolf? Of course, because it’s a moving, inspirational experience that we carry with us for life. Put a price on that. Dave, amazing photo once again! I agree that the government should not have the right to deny access to parks that belong to us. The divisions in govt are not the fault of the representatives who are expected to act according to their constituents expectations, but are actually a sign of division among Americans. If they can’t agree, then just leave the gates to the parks open. Thanks Scott! Our parks need to be politically neutral, well-funded, and rather than shut the gates, we need to redouble our outreach efforts to make these extraordinary places accessible to all. And you can’t pick and choose which to keep open – WW2 Memorial or Yellowstone mean different things to different people and offer unique expressions of freedom. I look forward to the time when (hopefully) the Repub party fades away into irrelevance. What good are they for anymore? They offer nothing but tantrums and hypocrisy. Dead weight. Thanks Jack! I just look forward to a day where unreasonable people become ostracized. Regardless of party affiliation, allow us to be awed by nature! First of all this is an amazing image. Thanks for sharing it. Back on September 17th I decided to make a road trip, so I packed the car with camping gear and cameras and headed out on the 18th. I covered a big percentage of the Colorado Plateau and some of the southern part of Colorado. I visited the Great Sand Dunes NP, Mesa Verde NP, Grand Canyon NP, Zion NP, Bryce NP, Capital Reef, traveled through Escalante area and Colorado National Monument. My first time for most of them. I was awe struck and fell in love with all of it. Sitting in meditation on the south rim of the Grand Canyon as the sun rose was one of the best ways to start a day. There was no need to shoot an image, just being there was enough. Then they shut it down after I got back. Anger welled up inside. I imagined it to be similar to the feelings of the Native American Indians. The government and it’s assuming power. I’m still angry. Your trip sounds remarkable! and inspiring… I hope the bitter memory of the shutdown disaster doesn’t fade. I’m still pissed too!